TORONTO — Ryan Fry leans on a wall near the Mattamy Athletic Centre locker-room, his broom in one hand and a water bottle in the other, and tilts his head to the side as he thinks about what he's learned during an unforgettable curling season. "We pushed it one more year because we were such good buddies," Fry said. "Realistically we should have probably made a switch last year but we wanted to give it one more chance to see if we could get it. For the most part, we were." "It's great being able to go and have the opportunity to play," Fry said. "Because to be honest with you, after Red Deer in November, I was feeling pretty down that my opportunities ... that it was going to take a lot of work to get back to where I wanted to get. It just was a change that I had to make and it's amazing how many people will support you along the way. "I really have my family and my fiancee Jessica and everyone to thank for that because we really created a plan and built from it. We were able to dig out of something that was pretty monumental fairly quickly." During his time away, Fry was able to take stock of where he was and where he wanted to go. "That's one thing that I really started to realize is that I need to fill my time and my life with more than just training and more than just practising and competing," he said. "For so many years, that's all I was doing." "The amount of people that are able to throw negativity at you through the safety from behind a computer and really break people down, it's a sad time for all that," Fry said. "I knew that it was a mistake. To be honest with you, I was up first thing in the morning, apologized, made amends for it before the sun even came up. "But that wasn't enough. (Social media) already took it." "When I came to the understanding that this was ending and made peace with that myself, it opened up this relief," Fry said. "That anxiety that I had with trying to be perfect on the ice really started to dissipate. "I was able to just start playing without the fear of losing what I had." 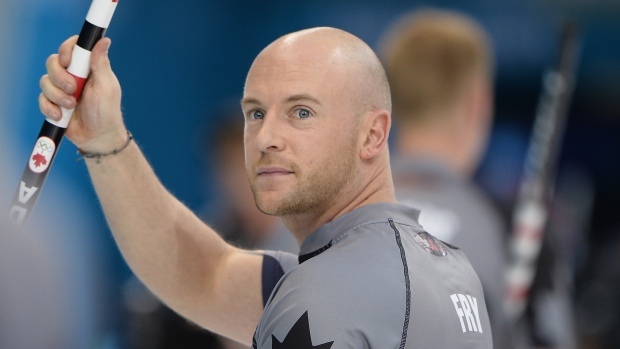 "That's the biggest lesson that I've learned — that curling isn't everything — and it always has been for me," Fry said. "So it's going to be nice now to be able to turn the page on my 30s and really start working towards becoming the man I want to be and grow into a life that has a little bit more to it than just the sport of curling." Fry was able to pull other positives from the experience too. "It definitely was good for me as a person because I know the type of person I am," he said. "I know I'm forgiving of myself because if you're not, it's very difficult to grow. But I grew from it. "I know that going forward it's going to serve me with a larger sense of maturity and a larger sense of respect for the way I conduct myself. Not only personally, but as a public figure." Marc Kennedy will replace Fry at third next season. On the Epping team, Mat Camm will move from third to second and Brent Laing will go from second to lead, with Craig Savill the odd man out. Fry said when he looks back at his seven-year run with his current team, he's most proud of the friendships that he has built with Jacobs, second E.J. Harnden and lead Ryan Harnden. And he's also bullish on the potential they'll have on the ice next season. "I think going forward Brad's team with Marc is going to be an exceptional team," Fry said. "I think they're going to set a standard of what I now get to try to build my new team with. That's an exciting thing for me as well." Edin will meet Bottcher in the quarterfinals Saturday afternoon while Howard goes up against Koe. Jacobs and Gushue will take on teams emerging from the tiebreakers. Fujisawa will play top seed Anna Hasselborg of Sweden in the quarterfinals. Winnipeg's Jennifer Jones takes on Casey Scheidegger of Lethbridge, Alta., Tracy Fleury of East St. Paul faces Kerri Einarson of Gimli in an all-Manitoba match and Robyn Silvernagle of North Battleford, Sask., plays Calgary's Chelsea Carey.